Michael McFadyen's Scuba Diving - Diana's Ridge The airport at Rarotonga, the main island of the Cook Islands, is located on the north-western corner of the island. The runway (which is large enough to handle Boeing-747s, extends a little out across the edge of the original shoreline. The runway runs approximately east-west (perhaps the western end is slightly south of west). Straight off the centre of the runway there is a dive site called Diana's Ridge. This is also straight off the beach to the south of the runway and north of Black Rock and the dive sites called Black Rock Chimneys and Black Rock Passage. This site is very close to the fringing coral reef. This site is about nine minutes from Avatui Harbour. The anchoring spot is about 20 metres off the fringing reef. The GPS reading for this site is a latitude of 21° 12.164' S and longitude of 159° 49.353' W. Note that this GPS Reading was taken using WGS84 as the map datum. See my GPS Page for more details. This site consists of a series of ridges and many gullies. The depth at the anchoring spot is about five metres. The depth to the west drops to 13 metres and then 15 metres. The ridges that give their name to the site run to the north-west from the anchoring spot. The main ridge gradually drops to 25 metres towards its end. It is probably 100 metres or so from the anchoring spot to the end of the ridge. At the end, the depth drops to probably 35 to 40 metres. To the north of this ridge there is another similar ridge and south there is yet another. You swim out along the main ridge and return back along the gully to the north. Back near the anchor spot, there is a large crack running east back into the shallower reef. It is about three metres wide and five metres deep. Unfortunately, I did not get a chance to inspect it as I had no bottom time left to explore it when I sighted it. The coral here is probably the best I saw in Rarotonga. There was probably about 30% live coral, about double the best I saw there. The coral was brain coral, with it looking a lot like cooled lava fIows. Like every other Rarotonga dive site, there were no sponges at all and not even a tiny gorgonia (let alone a huge one like seen in many South Pacific Ocean countries). There were some blue, yellow and pink Christmas tree worms in the coral, one of only a few locations that we saw them. There were a few giant clams, although not too huge. 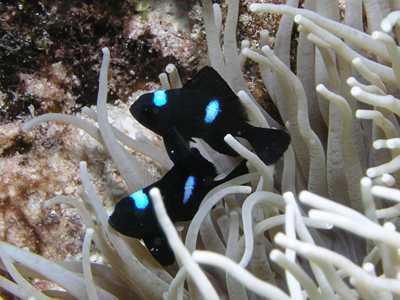 One thing that we saw were a few small anemones, with three spot dascyllus being the only anemonefish seen. 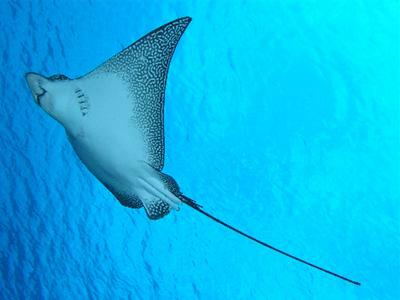 The one exciting thing we saw on this dive, in fact the only really exciting thing I saw in the ten dives we did in Rarotonga, was a school of about 10 to 12 spotted eagle rays. Of these, two came very close and one in particular swam around us a few times. My partner, Kelly was videoing one (the one in the photograph above), when it swam right into her exhaust bubbles and bolted, almost running into me. Apart from the above fish, fishlife was sparce. We saw a Guineafowl moray eel and there were a few surgeonfish and trevally, some different butterflyfish (threadfin, longnose) and a few Moorish idols. That is about it except for a few black sea cucumbers and a couple of small giant clams. The other good thing about this dive was the visibility, in excess of 40 metres. Water temperature in June was 24.0° and air temperature 23-25°.